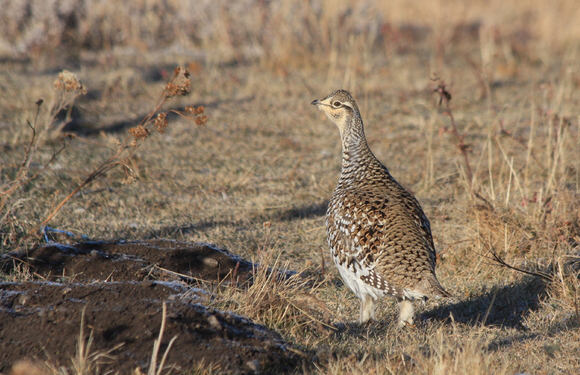 The Sharp-tailed Grouse, Tympanuchus phasianellus (previously: Tetrao phasianellus), is a medium-sized prairie grouse. It is known as “fire grouse” or “fire bird” by Native American Indians due to their reliance on brush fires to keep their habitat open. The birds are historically referred to as “chickens” by field trial trainers who make their way to the prairies of North & South Dakota, Manitoba and Saskatchewan in the summer months. Adults have a relatively short tail with the two central (deck) feathers being square-tipped and somewhat longer than their lighter, outer tail feathers giving the bird its distinctive name. The plumage is mottled dark and light browns against a white background, they are lighter on the underparts with a white belly uniformly covered in faint “V”-shaped markings. These markings distinguish sharp-tailed grouse from lesser and greater prairie chickens which are heavily barred on their underparts. Adult males have a yellow comb over their eyes and a violet display patch on their neck. This display patch is another distinguishing characteristic from prairie chickens as male prairie chickens have yellow or orange colored air sacs. The female is smaller than the male and can be distinguished by the regular horizontal markings across the deck feathers as opposed to the irregular markings on the males deck feathers which run parallel to the feather shaft. Females also tend to have less obvious combs. Males weigh an average of 33.5 oz (951 g) and females average 29 oz (815 g). Sharp-tailed grouse historically occupied eight Canadian provinces and 21 U.S. states pre-European settlement. They ranged from as far north as Alaska, south to California and New Mexico, and east to Quebec, Canada. These birds forage on the ground in summer, in trees in winter. They eat seeds, buds, berries, forbs, and leaves, also insects, especially grasshoppers, in summer. The sharp-tailed grouse is a lekking bird species. These birds display in open areas known as leks with other males, anywhere from a single male to upwards of 20 will occupy one lek (averaging 8-12). 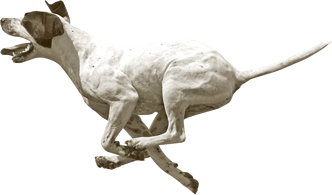 A lek is defined as an assembly area where animals carry on display and courtship behavior (Merriam-Webster Dictionary 2010). During the spring, male sharp-tailed grouse attend these leks from March through July with peak attendance in late April, early May. These dates do fluctuate from year to year based on the weather. The males display on the lek by stamping their feet rapidly, about 20 times per second, and rattle their tail feathers while turning in circles or dancing forward. Purple neck sacs are inflated and deflated during display. The males use “cooing” calls also to attract and compete for females. The females select the most dominant one or two males in the center of the lek, copulate, and then leave to nest and raise the young in solitary from the male. Occasionally a low-rank male may disguise himself as a female and walk to where the dominant male is and fight him.